21:11 GMT – Georgian President Mikhail Saakashvili has accepted the terms for a ceasefire in South Ossetia which were put forward by Russia and France. 19:18 GMT – The leader of South Ossetia, Eduard Kokoity has welcomed the peace plan proposed by the Russian and French presidents in Moscow on Tuesday. 19:12 GMT – French President Nicolas Sarkozy and Georgia’s President Mikhail Saakashvili are holding talks in Tbilisi. 19:01 GMT – Georgian government confirms the withdrawal of its troops from the upper part of the Kodori Gorge. 18:10 GMT – Moscow is concerned over Kiev's ‘biased and one-sided position’ on Georgia’s aggression against South Ossetia, the Russian Foreign Ministry said in a statement posted on its official website. 17:40 GMT – The restoration of the Capital of South Ossetia, Tskhinvali, will take at least two years, said Russian Emergencies Minister Sergey Shoigu. 17:22 GMT – French President Nicolas Sarkozy arrived in Tbilisi to meet with Georgia’s President Mikhail Saakashvili. 17:01 GMT – British Prime Minister Brown praised South Ossetian peace plan revealed in Moscow. 16:37 GMT – Russia declares a period of mourning for war victims. 16:31 GMT – Georgian troops have been forced out of Kodori gorge, according to Abkhazian Deputy Defence Minister. 15:59 GMT – Detailed battle plan discovered in a Georgian staff vehicle sheds light on Tbilisi’s plans for South Ossetia, says Russian military official. 15:55 GMT – Some NATO members suggest reconsidering relations with Russia, according to the U.S. envoy to the alliance. 15:49 GMT – Pentagon announces U.S. has finished transporting Georgian soldiers from Iraq to Georgia. 15:46 GMT – Georgia to announce three day period of mourning, starting August 12, says Saakashvili. 15:32 GMT – Russia is not keeping any peace in Georgia, says U.S. Deputy State Secretary Matthew Bryza. 15:29 GMT – Georgian envoy to NATO has asked for military hardware to be supplied by alliance members. 14:52 GMT – EU is ready to take part in peacekeeping missions in the Caucasus, says French President Sarkozy. 14:42 GMT – Russia will call for an international discussion of war crimes in South Ossetia, says Medvedev. 14:11 GMT – The situation in South Ossetia won’t affect Georgia’s prospects of joining NATO, says de Hoop Scheffer. 13:44 GMT – NATO chief Jaap de Hoop Scheffer welcomes news of Russia ending military operation in Georgia. 13:28 GMT – Saakashvili says he has personally seen Russian troops shelling Tskhinvali. 13:13 GMT – Saakashvili says Georgia is revoking peacekeeping agreements with Russia and Abkhazia. 13:00 GMT – American embassy in Tbilisi confirms to Interfax that a U.S. citizen was wounded in the South Ossetian combat zone. 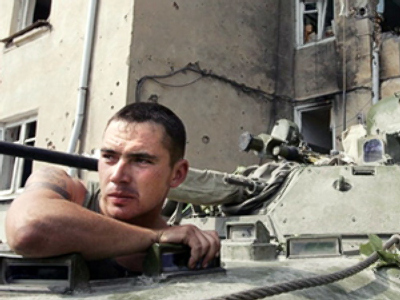 12:54 GMT – Russian peacekeepers report being sporadically shot at by Georgian troops. 12:45 GMT – Georgian reports claiming that the Russian military is continuing to attack are provocations, says the Russian Defence Ministry. 12:35 GMT – President Saakashvili announces that Georgia is to quit the Commonwealth of Independent States and calls on other members to follow. 11:41 GMT – Tskhinvali mayor says 70 percent of the city’s buildings were destroyed during the conflict. 11:29 GMT – Russia’s military operation in South Ossetia was partially caused by tension over Kosovo and the U.S. anti-missile system in Europe, according to the Belgian Foreign Minister. 10:35 GMT – Georgia's Foreign Minister won’t take part in a NATO meeting in Brussels, reports the France Press agency. 10:22 GMT – Russia’s announcement about the end of the military operation in South Ossetia “is good news”, says French President Nicolas Sarkozy. 10:02 GMT – “Tskhinvali and Sukhumi are our Jerusalem, and we won’t wait for 2,000 years to reclaim them,” says the Speaker of the Georgian Parliament. 09:44 GMT – The Russian military denies bombing a Georgian oil pipeline. 09:35 GMT – Russia will partially withdraw its troops from South Ossetia after ceasefire is established, says a military official. 09:22 GMT – A Russian military spokesman says the country will cooperate with the U.S. and NATO, despite Western support of Georgia. 09:05 GMT – A Russian military official says that its troops in South Ossetia have been ordered to stop advancing. 08:54 GMT – Russian President Dmitry Medvedev decides to end military operation in Georgia. 08:37 GMT – Finland's foreign minister says that the Organisation for Security and Cooperation in Europe (OSCE) is not interested in blaming sides in the Georgian-Russian conflict, and only wants an end to violence. 08:34 GMT – U.S. blocks Russia-NATO Council meeting, according to the Russian envoy to the alliance. 08:22 Russian President Dmitry Medvedev will meet with his French counterpart, Nicolas Sarkozy, in Moscow on Tuesday, to discuss the situation in Georgia's breakaway republic of South Ossetia. 08:00 GMT Russia will have to review its approach towards negotiations on the situation in Georgia, as the leadership in Tbilisi cannot be trusted, according to Russian foreign minister Sergey Lavrov. 07:32 GMT Russian special services arrest a senior Georgian foreign intelligence officer. It says he was gathering intelligence on Russia’s military in the North Caucasus and following the movements of the South Ossetian president Eduard Kokoity. According to the FSB he is the deputy director of the Georgian Foreign Intelligence Service. 02:01 GMT Abkhazian troops have begun an operation to pull the Georgian military out of the upper part of the Kodori Gorge. 01:46 GMT Russia has rejected a draft resolution on Georgia-South Ossetia conflict, introduced by France at the UN Security Council meeting.